Wellness Patrol: Do you know what is in your sunscreen? They are designed to protect our skin from sun damage, but some experts are now questioning whether some sunscreens could be harmful as well as beneficial. New research suggests that the complex cocktail of chemicals which helps to stop the sun's rays from causing skin cancer and premature ageing can contain carcinogenic substances. These chemicals can also prompt skin reactions, while the instructions on the bottles are often not clear enough. While dermatologists agree that the dangers of sun exposure without a sun cream far outweigh any dangers the creams might pose, should we be more choosy about what we put on our skin? Sunscreens come in two main forms: chemical sun creams, which contain ingredients that bind with skin cells, and physical blocks, which are made with titanium and zinc and stay on the surface of the skin, reflecting harmful rays away from the body. Some sunscreens are a combination of both. In the past, chemical or combined versions have been most people's choice because, unlike titanium and zinc-based screens, they do not create a white film. But opinion is changing. Researchers at the University of Zurich, Switzerland, have discovered substances, called endocrine disruptors, which mimic oestrogen in five ultraviolet screening chemicals found in sun creams. While their studies did not show they were harmful to people, they caused developmental problems in animals and made cancer cells grow more rapidly. Dr Nick Lowe, a leading consultant dermatologist from the Cranley Clinic in London, stresses that this study must be seen in context. Nevertheless, no one is certain how much a chemical that binds with skin tissue, as in the case of chemical sunscreens, is absorbed. Dr Ashworth suggests that physical sun blocks are safer until more is known, as titanium and zinc are inert. Fortunately, many physical blocks are invisible when applied. Dr Hauschka's Sunscreen Lotion SPF15 does not show at all, while the SPF20 creates a fine white tinge on some skin shades. Sun Sense's Daily Face SPF30 is slightly tinted, so it is a physical sunscreen giving maximum protection without the pale-faced look. She says an adult body in a swimsuit needs 100 ml of sun cream - a third of a small bottle. Tesco has just launched an innovative chemical sun cream for children which ensures the whole body is covered. The Kid's Colour Change Spray SPF35 sprays on purple and turns clear when rubbed in. To be effective, sun protection also needs to be applied every two hours, or every time you get wet from swimming or sweating, and 20 minutes before going out in the sun. 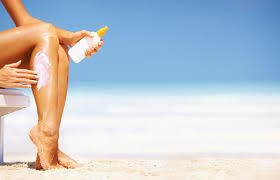 'Because people apply sunscreen they think they can spend more time in the sun,' says Kate Law. This could explain why even though we are buying more sunscreens, the rate of malignant skin cancer is still rising. More than 5,000 people a year die of malignant melanoma and 50,000 require operations. Even with lashings of lotion, you should still avoid the midday sun, wear clothes as protection and do not overdo the sunbathing. Any sun protection less than SPF15 is barely worth using in Britain. In Europe or anywhere warmer, slap on a factor 30 or higher. But even wearing a high SPF is not enough. Check that your sun cream screens not only UVB light but also UVA light and infrared. Most creams now have a star system for indicating UVA protection, with four stars giving the best results and being the only one worth considering. 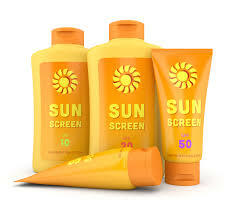 Skin sensitivity to chemicals in sun blocks can cause irritation and even full-blown allergies. Anyone can develop an intolerance to any one of the ingredients. Benzophe-none-3, one of the chemicals isolated in the test, can irritate skin. However, irritation is far less likely with physical blocks because zinc and titanium do not bind with skin cells. Dr Ashworth suggests you test out your cream on the side of the neck twice a day for three days before your holiday. If your skin tingles or reddens then change brands immediately - otherwise the continued use of it could turn into an unpleasant allergy. Luckily, sunscreens are now so well tested that the chances of irritation are minimal. In fact, many dermatologists believe you are far more likely to develop a problem with after-sun lotions, as these are designed to penetrate the skin.